Over the past decade, Allied Steelrode has become known in the steel industry for its passion for customer service and bold, strategic investments in advanced technology. To date, the company’s largest investment has been in a dedicated stretcher leveller, which was especially manufactured to Allied Steelrode specifications. Ordered in 2013, it was installed in a new purpose-built facility in Midvaal in the first quarter of 2015. Additional investment of this nature – namely a second and even more powerful stretcher leveller with higher specification – is being installed at the same Midvaal facility, with additional technology investments to follow later in 2019. However, in a further investment in the future – and customer service excellence – by this leading steel major, Allied Steelrode has embarked on state-of-the-art software upgrades of its cut-to-length lines. This involves a complete strip-out and replacement of the electronics on these lines; and the introduction of new, custom-developed software to ensure continuously improving efficiency and productivity levels. So far, the company has completed the upgrade of its CTL4 cut-to-length line in January 2017; while the upgrade to its CTL3 line is imminently due for completion. Allied Steelrode Deputy Chief Executive Officer (CEO) Justin Cloete explains the background to this ambitious programme: “Our cut-to-length lines were procured many years ago from an Italian manufacturer. Over the years, the level of online support from this company waned to a point where we needed to look for an alternative source of support. In addition, since those machines were introduced, control electronics have advanced considerably. The outdated electronics and software meant that these lines were operating at reduced output and were becoming expensive to maintain. Allied Steelrode’s Chief Operating Officer (COO), Marius Bezuidenhout, had previous experience with Nidec Industrial Automation, an international electronics and software company with a strong South African footprint. “We turned to local industrial automation experts Nidec for a complete upgrade of both machine control electronics and the related software,” he explains. In an exciting development for Allied Steelrode, the CTL3 line has been uplifted from the company’s Alrode facility and is being installed at Allied Steelrode’s Midvaal plant. However, during the installation, the front and back sections will be separated. Into this 15 m-long gap, Allied Steelrode will be installing a new 250 ton stretcher leveller retrofit section. Together with the CTL3 back- and front-ends, the new retrofit will complete Allied Steelrode’s second stretcher leveller line; which will be situated next to – and augment the operation of – the existing stretcher leveller. Bezuidenhout explains that, as Allied Steelrode’s stretcher material (ASSM) has become an increasingly sought-after brand in the South African steel industry, the demand for this material has increased. The new second stretcher leveller will help to meet this demand and shorten delivery lead times to their customers. “Also, as the two stretcher levellers achieve longer service lives, having two machines will allow for rationalisation of the maintenance programme,” he adds. In terms of processing steel, the two stretcher leveller lines will complement one other in such a way that a greater range of coil widths, grades and thicknesses can be processed. “We put the thicker material on the machine with the thicker material range, thereby allowing us a longer production run through the thickness range. Changing from processing thick to thinner gauge material requires a blade change; and whenever you do a blade change, you have to stop the machine. 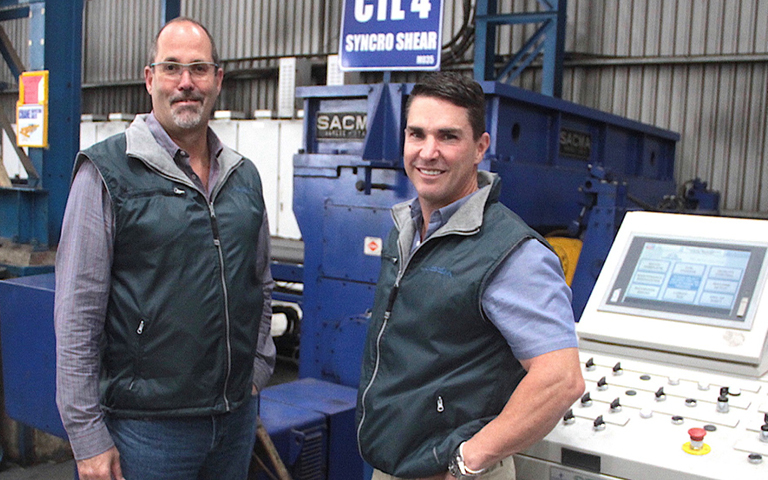 Fewer blade changes result in improved continuity of operation and higher productivity,” says Cloete. The CTL4 line will remain where it is currently in Alrode. However, with a complete electronics refit and new computer software, its efficiency and output will be greatly enhanced. With both the CTL3 and the CTL4 upgrades, Nidec software engineers had to spend some three months analysing every function of the two lines affected. This required input not only from the original equipment manufacturers (OEMs); but also Allied Steelrode’s technical team members, as a number of in-house upgrades and alterations have been made to these machines over the years. Once the electronic control upgrades had been finalised, Nidec developed new software to drive these two upgraded lines. The choice of software was Nidec’s Syptpro software, as well as Machine Control Studio and the Indusoft Scada suite – specific solution software for cut-to-length lines. With Nidec’s local presence, online support can be offered around-the-clock, a factor that will minimise downtime. However, Nidec has also offered professional training to Allied Steelrode operators and technical support staff, so that the latter can provide first-line support if required. This latest software and hardware is another quantum leap in Allied Steelrode’s steel processing trajectory, explains Cloete. The new control offers greater flexibility as in the case of the CTL3 which can be used as a flying or static shear. The reason for this combination of cutting styles is to improve machine efficiency at different lengths, thereby improving on production time. The control also improves accuracy which is a huge factor for the end-customer and also limits wastage for Allied Steelrode. The installation of the first stretcher leveller was the result of a deliberately planned ethos of strategic technological investment by the company. “Now, in this next visionary investment phase, the upgrades to the cut-to-length lines and the introduction of the second stretcher leveller will assure Allied Steelrode’s continued leadership of the local steel industry,” says Bezuidenhout. “With today’s trend towards limited stockholding, this new and exciting phase for Allied Steelrode will benefit our customers by further reducing lead times between order and delivery, reducing their wastage factor and assuring their future profitability,” Cloete concludes.